For other uses, see Tessera (disambiguation). "Abaciscus" redirects here. For the moth genus, see Abaciscus (moth). A mosaic made from tesserae in St Peter's Basilica, Vatican State, Italy. A tessera (plural: tesserae, diminutive tessella) is an individual tile, usually formed in the shape of a cube, used in creating a mosaic. It is also known as an abaciscus or abaculus. The oldest known tesserae dates to the 3rd millennium BCE, discovered in the ancient city of Shahdad in Kerman province, Iran. In early antiquity, mosaics were formed from naturally formed colored pebbles. By roughly 200 BCE cut stone tesserae were being used in Hellenistic-Greek mosaics. For instance, a large body of surviving material from the Hellenistic period can be found in the mosaics of Delos, Greece, dating to the late 2nd century BCE. Ancient Roman decorative mosaic panels and floor mosaics were also produced during the 2nd century BC, particularly at sites such as Pompeii. Marble or limestone were cut into small cubes and arranged into representational designs and geometric patterns. Later, tesserae were made from colored glass, or clear glass backed with metal foils. 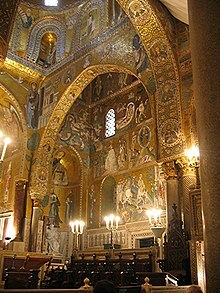 The Byzantines used tesserae with gold leaf, in which case the glass pieces were flatter, with two glass pieces sandwiching the gold. This produced a golden reflection emanating from in between the tesserae as well as their front, causing a far richer and more luminous effect than even plain gold leaf would create. These are manufactured glass tiles made to a uniform shape and size. They are made by molten glass being poured into trays and fired. An imprint of grooves is made on their underside for help with adhesion to cement when fixing. These are the cheapest range of bought materials and can be glazed or unglazed. The glazed ceramic tiles have the color painted onto the top of the clay and then fired to a high temperature in a kiln. The unglazed or body glazed version has the color mixed into the wet clay so the color runs through them. They vary in size. This is the classic mosaic material. It is opaque glass fired in large slabs in a kiln and then hand cut with a hammer and hardy chisel into small cubes. Their irregular finish makes them a wonderful reflector of light and this material is best used working straight into cement. It is produced in Venice and sold by colour and weight. This tile is made with real gold and silver leaf sandwiched between two layers of glass and fired twice in the kiln to embed in the metal. Mirror adds great depth and sparkle to a mosaic. It is cheap as offcuts from a glass cutting shop are often free. Use mirror glue as this protects the silver on the back of the mirror. Known for its translucent qualities stained glass is also available in opaque form. It comes as large sheets that can be cut into smaller sections with a glasscutter. It can provide areas of larger tesserae pieces for variety and contrast. Colours and surfaces are limitless and can add texture and contrast to mosaic work, especially in the technique known as trencadís or pique assiette. ^ Govind, Ranjani. "Small tiles, big tales". The Hindu. Retrieved 25 September 2015. ^ Menhem, Chantal (24 June 2015). "Numerous Tiles and Tesserae Making Mosaics". Mozaico. Archived from the original on 25 September 2015. Retrieved 25 September 2015. Wikimedia Commons has media related to Tessera.